I’m taking a break from the beach today to chat about a subject that’s can save you some serious shells (that’s dollars to you land-lubbers). With the temps dropping and the days getting shorter, you’re probably dreaming of a warm and sunny getaway. But if you’re using any of the popular vacation rental listing sites to book the vacation rental of your dreams, stop before you hit that “checkout” button. We know that browsing vacation rentals can be a challenge, which is why accommodation aggregators are so popular. These sites make it a breeze to book accommodations for the one in three US vacationers who now prefer vacation rentals over hotels. In fact, they’re so popular that you’ll even find our Villas listed on all of them! But that convenience, as it always does, comes at a price. These sites stay afloat by charging vacationers – YOU – a booking fee on top of the rate charged by the rental. The fee is usually a percentage, and can be as much as 12%. Depending on where you’re staying and for how long, that can eat up a large portion of your vacation budget. Some even add on extra fees such as extra guest charges and cleaning fees to the initial charge, making it hard to see exactly what you’re paying, and for what. These added fees are no picnic for the rental owners, who already pay a significant fee to be listed on these sites in the first place. Often owners will need to increase their prices to cover the aggregator’s fees and extras – resulting in you paying far more for your chosen accommodation than you would by booking direct. Not only that, but the lack of transparency is difficult for owners as well. After all, owners want you to trust them and feel looked after throughout the whole process. That’s difficult to achieve when a third-party is handling the booking on their own terms! As you can see, although these aggregator sites can be great for finding the accommodation you want, they’re not the best option for booking it. To get the best bang for your buck, book directly with the vacation rental instead. You’ll skip the booking fee and may get a better deal on rates as well. Better still, by booking directly with the owner, you may get to take advantage of unadvertised long-term or off-season rates! Most vacation rentals have their own websites, Facebook pages or social media accounts that offer direct access to the property owners. Some will have their own eCommerce software for seamless booking, while others will happily take your booking over the phone. For the best nightly rates, just get in touch directly! The easiest way to do this is to look for the name of the property in the listing, then do a quick Google search. While you’re on the phone, don’t forget to ask about local tours or activities. Booking these through the “usual suspects” can be expensive and inflexible. But doing so through your vacation rental owner can net you local rates – and recommendations for the providers that locals trust. And with the money you’ll have saved on accommodations, you’ll have more to spend on seeing the sights! So the next time you’re looking for that perfect place to stay, skip the aggregators and stop by the rental’s own website instead. 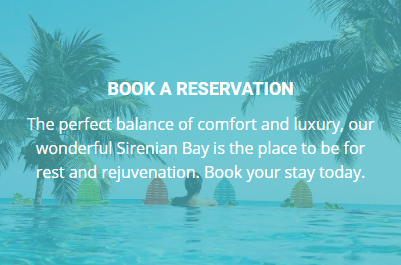 At Sirenian Bay Resort & Villas, we’re always happy to hear from our guests – and we’re all about delivering a truly priceless vacation getaway. Exploring the Towns and Cities of Belize Let’s “sea” in the New Year, Placencia-style!